This group is subdivided into ssp. conopsea and ssp. densiflora, the latter having denser flower heads than the former. Colour variations are common. 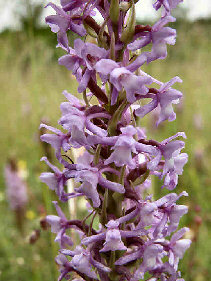 These orchids grow in calciferous soil on dry hillsides, dry and damp meadows, and flat moors. These photos are all of dry hillsides. 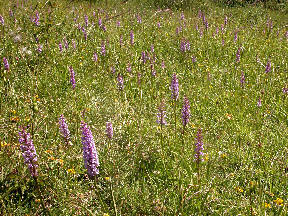 This photo shows some of the plants found growing with the orchids. 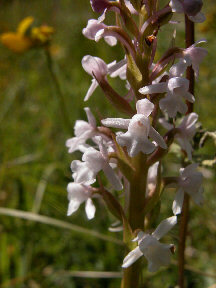 There is a fly orchid right beside the fragrant orchid. 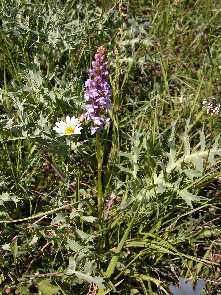 Both are in the middle of a patch of extremely spiny thistles; photographing wild orchids is not easy. This is the mauve variation. It is the most often found colour. Pink flowers are also very common. This might be ssp. densiflora. 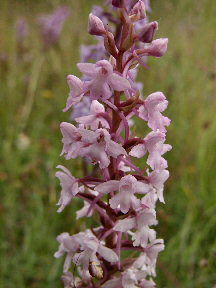 This is the white variation, not as common as the pink and mauve. This plant might be ssp. conopsea.